E Ergul, B Korukluoglu, S Yalcin, Y Ozgun, A Kusdemir. Pancreatic Cyst Mimicking Cancer In A Young Girl. The Internet Journal of Surgery. 2007 Volume 14 Number 2. We present a pancreatic pseudocyst which was mimicking a mucinous cystic tumor in a young alcoholic girl. As the frozen section examination revealed a pancreatic pseudocyst, a cystogastrostomy was performed. The postoperative period was uneventful. Cystic tumors of the pancreas occur with less frequency than solid lesions, and are often detected incidentally, as many of these lesions are small and asymptomatic. Cystic lesions of the pancreas comprise a broad range of pathological entities. With the exception of the pancreatic pseudocyst, they are usually caused by pancreatic cystic neoplasms. Non-neoplastic pancreatic cystic and cyst-like lesions are extremely rare. We present a pancreatic pseudocyst which was mimicking a mucinous cystic tumor in a young alcoholic girl. A 17-year-old female patient was referred to our hospital with the chief complaint of an abdominal mass. She had complained of abdominal discomfort and weight loss. Also, she had a history of chronic alcoholism. On physical examination, a 10x8cm well-shaped mass was detected in the left lower abdomen. Liver tests and other laboratory tests revealed no abnormalities. Echinococcus immune hemagglutination test was negative. Intravenous and oral contrast CT scan revealed an 80×78mm homogenous cyst in the left posterior retroperitoneal space (Figure.1). The cyst was pressing against the stomach. 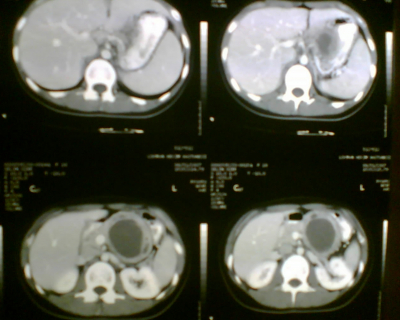 The physical, radiological and laboratory findings of the patient pointed to a mucinous cystic tumor of the pancreas. Figure 1: A cystic mass mimicking a mucinous cystic carcinoma of the pancreas can be seen which is pressing against the stomach. As the frozen section examination revealed a pancreatic pseudocyst, a cystogastrostomy was performed. The postoperative period was uneventful. The patient was discharged in good health at the sixth day after the operation. Cystic tumors of the pancreas may be associated with pancreatitis or may have malignant potential. With advancements in diagnostic imaging, cystic lesions of the pancreas are increasingly detected; in some reference centers up to 30% of pancreatic resections are performed for cystic tumors1. When dealing with pancreatic cysts, the aim of imaging is to differentiate cystic tumors from tumor-like lesions and to characterize the cystic tumor, distinguishing benign tumor, which does not usually require surgical excision, from borderline or malignant tumor, which must be resected whenever possible. It can be very difficult to differentiate non-tumoral cystic lesions from neoplastic lesions on the basis of imaging criteria alone; in order to achieve a correct diagnosis it is important to correlate the imaging findings with the clinical history of the patient and the presence or absence of symptoms. Tumor marker analysis of cyst fluid was found to be a safe and useful adjunct in distinguishing inflammatory lesions and benign neoplasms of low malignant potential from malignant or premalignant pancreatic cystic lesions2. Aljebreen et al. suggested that carcinoembryonic antigen and CA-19.9 are the most reliable markers for this reason2. Mucinous cystic tumors of the pancreas occur exclusively in women. These neoplasms are preferentially located in the body and tail of the gland. They are characterized as uni-/multilocular cysts that do not communicate with the ductal system. The tumor is encapsulated and lined by columnar mucin-producing cells overlying an ovarian-like stroma3. This may explain the exclusive incidence in female population. It can be seen at a wide range of age. Early diagnosis of malignant transformation of the mucinous cystic tumor is essential since the prognosis, once the malignant form occurs, is the same as for ductal adenocarcinoma, while in the in-situ forms surgery could be curative. Mucinous cystic tumor of the pancreas is a premalignant lesion and it is important therefore to distinguish it from other cystic lesions of the gland. Pathologists can detect all the different degrees of malignant transformation at the same time in the same lesion.